MAISON DE LUXE DE 9 CHAMBRES AVEC PISCINE OVERSIZE À PIED DU CLUBHOUSE. 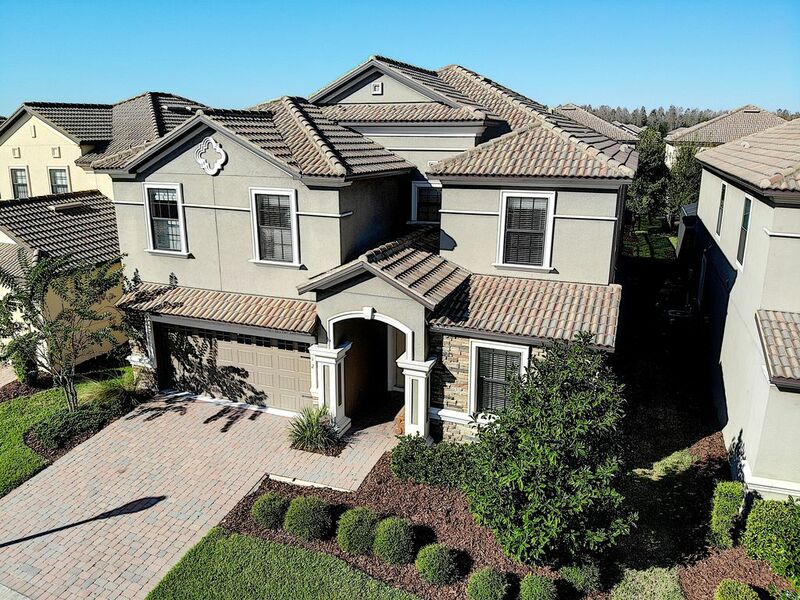 RÉSERVEZ VOTRE SÉJOUR DANS CETTE INCROYABLE VILLA DE 9 CHAMBRES PENDANT CETTE OFFRE SPÉCIALE ET GAGNEZ GRANDS VOS VACANCES À PROXIMITÉ ORLANDO. Nous sommes heureux d’offrir cette location de vacances magnifique et immense de 9 chambres à coucher et 5 salles de bain. L'extérieur de la maison est tout simplement magnifique avec une façade en brique, une allée pavée et une entrée de la maison. Cette location de vacances est peinte et décorée par des professionnels et son mobilier en cuir est magnifique. La cuisine dispose d'appareils en acier inoxydable avec des comptoirs en granit et d'élégantes armoires sombres. Le lit à baldaquin dans la chambre principale est magnifique et la chambre à coucher avec 3 lits queen size, ainsi que la chambre à coucher Mickey, seront un énorme succès avec les enfants. La salle de jeux dispose d'une table de billard, d'air hockey, de baby-foot et d'un grand téléviseur LCD. La piscine et le spa sont parfaits pour se rafraîchir et profiter du soleil de Floride. Faire des souvenirs spéciaux avec les êtres chers est l'une des plus grandes réalisations de la vie. Et lorsque vous visiterez cette magnifique maison de location, vous créerez des souvenirs qui dureront toute une vie. MAISON LOUE NORMALEMENT DE 499 à 795 PAR NUIT. La plupart des saisons de l'année ont des taux réduits qui s'appliquent et sont significatifs. LA MAISON A ÉTÉ RÉNOVÉE ET EST IMPRESSIONNANTE. RÉSERVEZ DÈS MAINTENANT ET PROFITEZ D'UNE INCROYABLE MAISON À UN GRAND PRIX. UN BLOC DU CLUBHOUSE AVEC PISCINE OVERSIZED NE SE TROUVE PAS DANS LA MAJORITÉ DES MAISONS DU RESORT. Lots of space. Great to have linens and towels there so we didn't have to pack them. We stayed here for our team trip to UCA nationals. 22 teens and 2 coaches and there was PLENTY of room! Spices need updated, but that's the only bad thing we have to say. Awful Experience. Do not rent from them. There were no directions on how to check in. I had to call the owner, who gave me the number to the rental company. She was very rude and gave me a code to get in. The alarm went off and she told me it would stop on its own. It did not. The police came. She had to give me the alarm code. The house was in horrible shape. I understand there will be wear and tear with rentals. But I at LEAST expect them to maintain them. There was an OBVIOUSLY broken headboard. Another bed had broken supports underneath. The hot tub would not heat (one of the main reasons we rented this house was the hot tub). The plumbing for the hot tub pump was leaking. When the maintenance supervisor came he said it was supposed to be fixed weeks ago. It was never fixed during our trip. The house was so dirty upon arrival. All the walls look gross. The beds didn’t look professionally made. The vents appeared to be growing things. The coffee maker had dirt in it. There was trash out in the front lawn. The pool had dirt and hair bands in it. The tables and surfaces weren’t clean either. I immediately called and complained to both the owner and the rental company. Nothing was done about it. I was told by the rental company that they would not send anyone out and that it didn’t match the pictures because they don’t take pictures between people. Apparently they don’t even take pictures every year. I was told the pool people would be there the next morning. They normally clean on mondays or Tuesdays regardless of when people check in or what’s in the pool. They came Tuesday. I had checked in Sunday. The manager called and said she would email me how to check in and out so I didn’t have to drive to the office. I never received an email. She also told me that she was talking to the owner about compensation and they would contact me back. I never heard from them. I tried to call on Saturday when I left but could only get voicemail. I rented this house for my friends and family who travelled from different states to come to my destination wedding. It was a complete disappointment and really dampened the whole trip. I will never rent from this company again. Sorry that you did not experience a better stay. The previous guests had damaged the home and the cleaning crew did not report the problems with the furniture or clean the home to an acceptable standard. We have ensured that the management company replaced that cleaning crew and the home has been deep cleaned and renovated since your stay. We have redone the interior of the home including new paint, furnishings, decor, and the hot tub has been repaired. The home is in great condition and I have inspected it myself and it looks great with everything working perfectly at this time. We had a great time. Spacious. Beautiful. Incredible house. We had 22 with plenty of room. So glad you had a good time. We have made upgrades to the home since your last stay which include new paint, new game room, new decor and furnishings. We will be posting the new photos of the home soon. and if you would like to stay again in the future let us know. Great Large group option for vacation! It was like being at home for vacation. We had plenty of space to spread out and to come together for meals and social time. Only suggestion would be to have a "Need to Know" booklet in the home for club house information and how to use appliances, etc. So glad you had a good trip. We hope you will be able to come and stay again in the future. The pictures online is a true replica of what's inside. There was plenty of space to accommodate the twenty one people in our family. We enjoyed the amenities of the resort. This home is in the perfect location only a block away from the Clubhouse and Oasis pool/ lazy river. I would highly recommend this property you will not be disappointed. Rates may change on a periodic basis and if reduced once your booking is made original booking price will apply as the rates offered as a last minute discount will not go into effect for existing reservations.